Earthquake Prediction: What’s causing the Lombok earthquakes? What’s causing the Lombok earthquakes? SEVERAL large earthquakes have struck the Indonesian island of Lombok in the past week, with the largest quake killing at least 98 people and injuring hundreds more. Thousands of buildings are damaged and rescue efforts are being hampered by power outages, a lack of phone reception in some areas and limited evacuation options. The majority of large earthquakes occur on or near Earth’s tectonic plate boundaries – and these recent examples are no exception. However, there are some unique conditions around Lombok. The recent earthquakes have occurred along a specific zone where the Australian tectonic plate is starting to move over the Indonesian island plate – and not slide underneath it, as occurs further to the south of Lombok. This means there is earthquake and tsunami risk not only along the plate boundary south of Lombok and Bali, but also from this zone of thrusting to the north. Tectonic plates are slabs of the Earth’s crust that move very slowly over our planet’s surface. Indonesia sits along the “Pacific Ring of Fire” where several tectonic plates collide and many volcanic eruptions and earthquakes occur. Some of these earthquakes are very large, such as the magnitude 9.1 quake off the west coast of Sumatra that generated the 2004 Indian Ocean tsunami. This earthquake occurred along the Java-Sumatra subduction zone, where the Australian tectonic plate moves underneath Indonesia’s Sunda plate. But to the east of Java, the subduction zone has become “jammed” by the Australian continental crust, which is much thicker and more buoyant than the oceanic crust that moves beneath Java and Sumatra. The Australian continental crust can’t be pushed under the Sunda plate, so instead, it’s starting to ride over the top of it. This process is known as back-arc thrusting. The data from the recent Lombok earthquakes suggest they are associated with this back-arc zone. The zone extends north of islands stretching from eastern Java to the island of Wetar, just north of Timor (as shown in map below). Earthquake hazards along plate boundaries near Indonesia. The dates in the map show historical earthquakes, and Mw indicates earthquake magnitude. Edited by P. Cummins from an original by Koulali and co-authors. Historically, large earthquakes have also occurred along this back-arc thrust near Lombok, particularly in the 19th century but also more recently. (Dates and sizes of past earthquakes are shown in the map above). It is thought that this zone of back-arc thrusting will eventually form a new subduction zone to the north along from eastern Java to the island of Wetar just north of Timor. Lombok’s recent earthquakes – the Aug 5 6.9 magnitude quake plus a number of aftershocks, and the 6.4 magnitude earthquake just a week before it – occurred in northern Lombok under land, and were quite shallow. Earthquake hazards along plate boundaries near Indonesia. Source: US Geological Survey. Earthquakes on land can sometimes cause undersea landslides and generate a tsunami wave. But when shallow earthquakes rupture the sea floor, much larger and more dangerous tsunamis can occur. 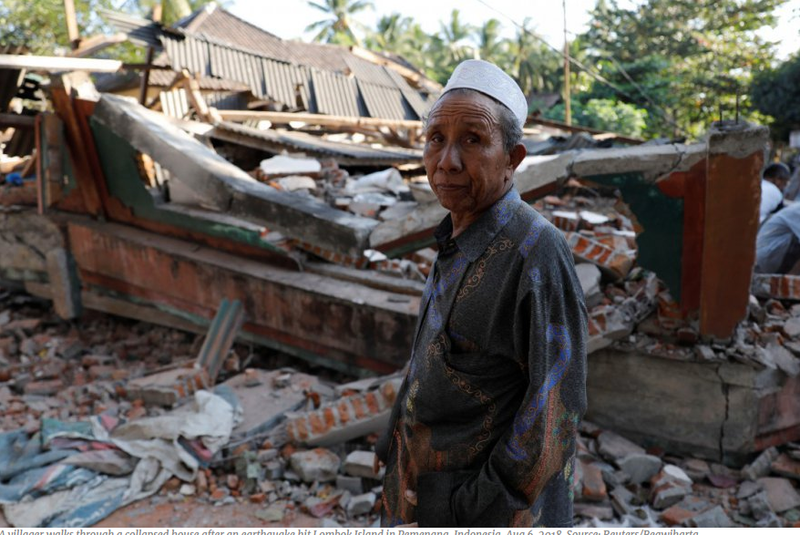 Due to the large number of shallow earthquakes along the plate boundaries, Indonesia is particularly vulnerable to tsunamis. The 2004 Indian Ocean tsunami killed more than 165,000 people along the coast of Sumatra, and in 2006, over 600 people were killed by a tsunami impacting the south coast of Java. The region around Lombok has a history of tsunamis. In 1992, a magnitude 7.9 earthquake occurred just north of the island of Flores and generated a tsunami that swept away coastal villages, killing more than 2,000. Nineteenth century earthquakes in this region also caused large tsunamis that killed many people. The areas around Lombok and the islands nearby, including Bali, are at high risk for earthquakes and tsunamis occurring both to the north and the south of the island. Unfortunately, large earthquakes like the ones this week cannot be predicted, so an understanding of the hazards is vital if we are to be prepared for future events.